Photo taken at Garrapata State Park © 2005 Dean W. Taylor. This fact sheet was prepared by Grey F. Hayes, Dean W. Taylor, and Dylan M. Neubauer under award NA04N0S4200074 from the National Oceanic and Atmospheric Administration (NOAA), U.S. Department of Commerce (DOC). The statements, findings, conclusions, and recommendations are those of the authors and do not necessarily reflect the views of the NOAA or the DOC. Sheltered canyons in coastal scrub/grassland along the immediate coast, bordering riparian areas, or on steep canyon, generally north-facing, slopes. Perennial herb 2–10 dm tall, base puberulent, firmly attached to the roots; leaves cauline or in a basal rosette (non-flowering individuals), petiole hairs generally spreading, leaves deeply divided with 3–17 lobes, the secondary divisions spreading; flowers generally 7-20, pedicels ± ascending, 8–40 mm long, the lowest flowers at full development 10–25 mm apart; lateral sepals 12–24 mm long, spur 11–19 mm long, tip generally downcurved > 3 mm (straight in D. variegatum ssp. variegatum), lower petal blades 5–10 mm long, the margins glabrous (ciliate in D. variegatum ssp. variegatum); ripe follicles erect (Koontz and Warnock 2013). The generally downcurved and transversely rugose spur is diagnostic for D. hutchinsoniae. 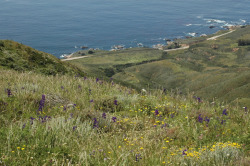 Pine Ridge Trail, Pfeiffer Big Sur State Park (Monterey County). Endemic to the Big Sur coast in central California in Monterey County. Similar and probably closely related to D. variegatum, though geographically separated. Delphinium hutchinsoniae has a decurved spur, whereas the spur of D. variegatum is normally straight (or decurved nearer apex). In addition, D. hutchinsoniae lacks marginal hairs on lower petals, whereas hairs are present in D. variegatum. Hybrids have been produced between D. hutchinsoniae and D. cardinale in a common garden experiment. Hybrids also occur with D. parryi ssp. maritimum (Warnock 1997). Field surveys are needed to document absence in suitable habitat along the Big Sur coast, where it is often sympatric with D. parryi. A Carmel Valley occurrence based on a single specimen has not been documented since 2002. The River Road occurrence, an inland outlier, is based on three specimens from 1952 and 1962. There has been some disagreement as to the identity of these specimens, but it appears that they are currently identified as D. hutchinsoniae. A housing development was built in the vicinity of these collections, and it is possible that the occurence was extirpated (Taylor, pers. comm. ; Yadon, pers. comm.). Field work is needed. Two new, small occurrences were documented in 2013 during a CNPS Rare Plant Treasure Hunt. On the Rocky Ridge Trail at Garrapata State Park, several thousand plants occur along a segment of the trail on very steep slopes, suggesting this species may be more abundant than available data indicate. In 2016, ca. 1000 plants were observed at UC Landels-Hill Big Creek Reserve on a slope near the entrance. Threats include recreational impacts, non-native species, and landslides. CNPS, Rare Plant Program. 2010. 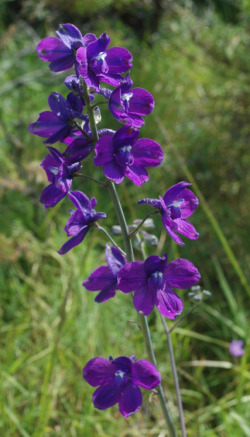 Delphinium hutchinsoniae, in Inventory of Rare and Endangered Plants (online edition, v8-02). California Native Plant Society, Sacramento, CA. http://www.rareplants.cnps.org/detail/555.html [accessed 5 February 2015]. Koontz, J. A. and M. J. Warnock. 2013. 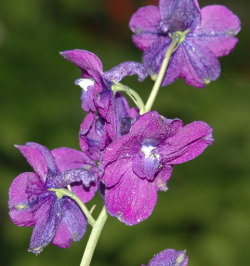 Delphinium hutchinsoniae, in Jepson Flora Project (eds.). Jepson eFlora, http://ucjeps.berkeley.edu/cgi-bin/get_IJM.pl?tid=22480 [accessed 5 February 2015]. Taylor, D. W. Personal communication (2014). Warnock, M. 1997. Delphinium. In: Flora of North America Editorial Committee, eds. 1993+. Flora of North America North of Mexico. 18+ vols. New York and Oxford. Vol. 3. http://www.efloras.org/florataxon.aspx?flora_id=1&taxon_id=233500513 [accessed 5 February 2015]. Yadon, V. Personal communication (2014).